Photo: Boddo Otto House, ca. 1766, Route 551 at Quaker Road, Mickleton, NJ. Listed on the National Register of Historic Places in 1976. Photographed by User:Ton2cats (own work), 2010, [cc-by-3.0 (creativecommons.org/licenses/by/3.0)], via Wikimedia Commons, accessed January, 2014. Gloucester County Courthouse is located at 1 North Broad Street, Woodbury, NJ 08096; phone: 856-853-3275. 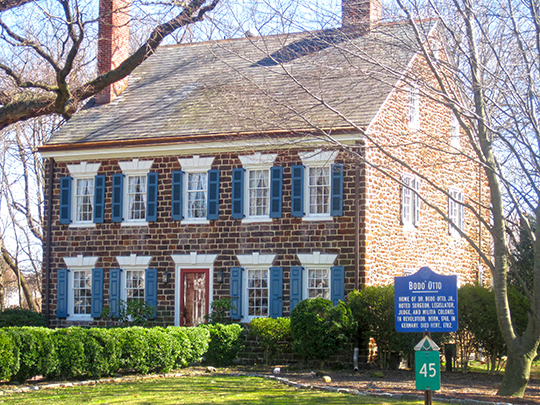 Proprietors, freeholders and settlers met in May of 1686 to approve the "Constitution of Gloucester County." The county seat (originally the City of Gloucester) was moved to Woodbury sometime around the Revolutionary War. The county size got smaller as first Atlantic County (1837), then Camden County (1844) were taken-off.